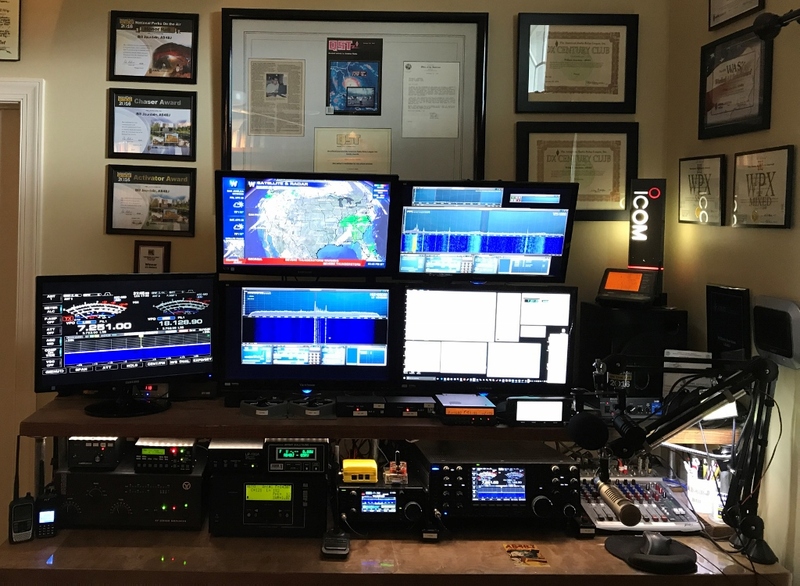 I am an Amateur Extra Class Amateur Radio operator in Calhoun, Georgia (Gordon County), and have been licensed since 1989. My first call was KC4MWH followed by N4XOG. Calhoun is in northwest Georgia approximately 50 miles south of Chattanooga, Tennessee, and approximately 70 miles north of Atlanta, Georgia. Northwest Georgia is known as the Carpet Capital of the World, and much of the U.S. carpet production takes place in and around this area. I formerly lived in Dalton (Whitfield County), Georgia (20 miles north of Calhoun), home to the Dalton Amateur Radio Club (W4DRC) which presents one of the southeast’s premier hamfests, every year on the fourth Saturday in February. The DARC is a non-profit organization, and an American Radio Relay League Special Services Club. The DARC has a long tradition of serving northwest Georgia in many capacities. For more information about the DARC, please visit the club website. Calhoun is home to the Cherokee Capital Amateur Radio Society. In addition to a weekly net on local repeaters, the CCARS has a Hamfest in April of each year. Click here to go the CCARS web site. Although in recent years I have been less involved in local amateur radio activities, I am the past President of the DARC, and have served as the Emergency Coordinator (Whitfield and Murray Counties) and the District Emergency Coordinator (Northwest Georgia) for the Amateur Radio Emergency Service. I have also served as a Volunteer Counsel for the American Radio Relay League (ARRL). In 1992, I traveled to south Florida to provide amateur radio assistance in the wake of the Hurricane Andrew disaster. An article about this trip was published in the December, 1992 issue of QST, the official publication of the ARRL. I have also served in a number of capacities in the Dalton Chapter of the American Red Cross, including Disaster Committee Chair and local Chair of the Board. 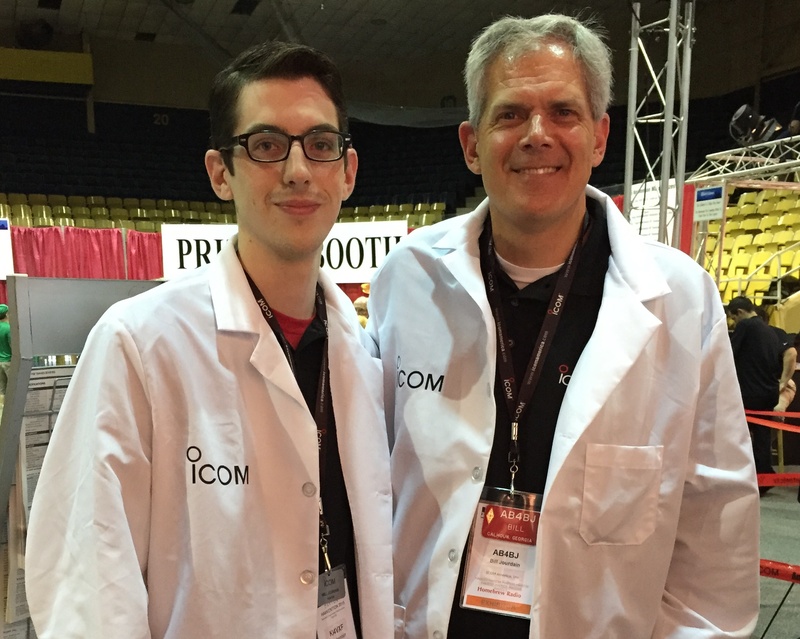 The Red Cross, both locally, regionally and nationally, has always partnered with amateur radio in times of need. I am a member of the Southeastern DX Club and have completed 20 meter, mixed and phone DXCC. I have also completed WPX, WAS and WAC. For QSL, I use LOTW, Bureau, eQSL and direct. One of my favorite HF activities is participation on the Geratol Net. This is a WAS net that operates every night at 0100 UTC between October and April on 3.668 MHz. Earning the BASIC award is the main goal of most, and this tough award requires working an Extra Class ham with an Extra Class formatted call sign in the Extra Class portion of the U.S. phone band in each of the 50 U.S. states. I achieved my BASIC award in January 2011 and am now the proud holder of Geratol number 2598. I received the Director Award in February 2011 and now hold Director Number 708. As of 2014, I have been continuously licensed as a ham for 25 years. With this in mind, I decided to join the Quarter Century Wireless Association (“QCWA”) and was given QCWA #36339. For HF in the ham shack, I currently operate a Icom IC-7851 and an Icom IC-7300 as my backup rig (and for VHF, UHF and D-Star). I love the IC-7851 and it has one of the very best receivers I have ever heard! I use an Electro Voice RE27ND mic the IC-7851 and a Heil PR-781 with the D-Star radios. I don’t use any outboard audio processing equipment and am very satisfied with the customization available in the IC-7851 settings. When I need a few extra S-units, I use an Acom 1010 Linear Amplifier. This is a wonderful amp that is very fast and easy to tune! One of the biggest dilemmas for my operating position is the speaker to use with my radios. After a bit of research, I decided to try a Voice Master speaker and a Sounds Sweet speaker. These speakers produce the best sounding audio I have ever heard coming from my various radios. Because these speakers are very large, I decided to use them for all of my audio (HF, VHF, UHF, D-Star and scanner) and therefore connected both speakers and all equipment through a Peavy PV-10 mixer and small Pyle Pro amplifier that I had sitting around the shack gathering dust. The result is great sounding audio from all sources and the ability to control and blend the audio from each source from one location. I also use a Radiosport headset from time to time. I run the system in three monitor mode with an extended desktop. 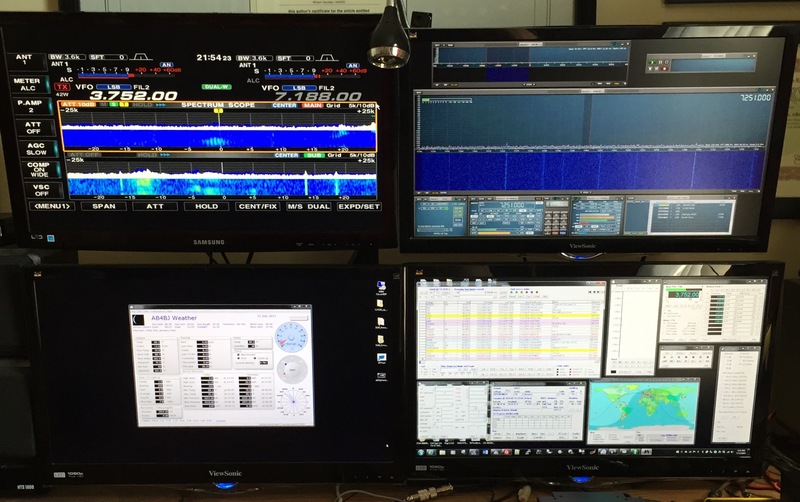 With three monitors I have more than enough screen landscape to view multiple open applications (the fourth monitor shown is a TV and monitor to display the high definition output of the IC-7851). This computer has become the heart and soul of my logging and DX spotting operations. My favorite software for logging and DX related functions is DX Lab. This free software suite is very impressive and offers rig control, logging, DX spotting and many more features. Not only is this software free and feature-rich, it has some of the best customer support I have ever seen. I am somewhat limited by subdivision restrictions and use a SteppIR BigIR III vertical with 80 meter coil and a G5RV wire antenna installed in a pine tree at 35 feet. I also use a Pixel Technologies RF PRO-1B receive loop. This receive-only antenna is fantastic and is connected with a splitter to the IC-7851 and a Perseus SDR receiver that I control with the Studio 1 software package. Two of my favorite accessories in the shack are the LP-100A Digital Vector Wattmeter and the Array Solutions Power Master II. I use a Palstar HF-Auto tuner with the G5RV. For Dstar, VHF and UHF in the shack I use an Icom ID-5100 with a Heil PR-781 mic (switched with a LDG SLS-2). I also use a Kenwood TM-742A for 2 meters, 440 mHz and 220 mHz with a Heil PR-781 mic . For portable operation, I use Icom’s 51A Plus 50th Anniversary Edition HT for 2 meter and 440 operation, and to play with D-Star either directly or though my computer connected DVAP. You can learn more about my D-Star activities on my D-Star page. For HF mobile I run the Icom IC-7100 with a Little Tarheel II antenna. I control the Little Tarheel with a West Mountain Target Tuner antenna controller. I am extremely pleased by the performance of the IC-7100, and have had fun working HF while driving down the highway! 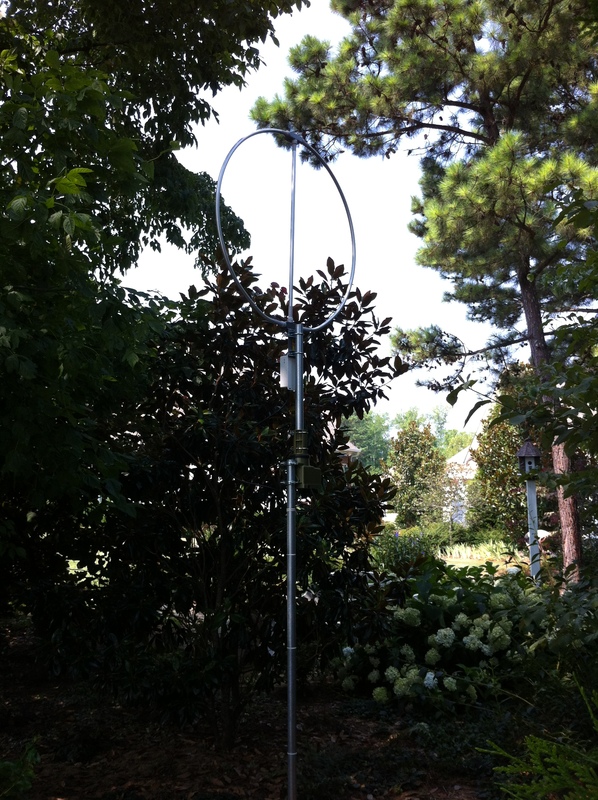 The Little Tarheel antenna is one of the best mobile antennas I have ever used, and it works great on all HF bands. The IC-7100 is an all band/all mode radio that also does D-Star. I like to play with APRS, and recently interfaced an Alinco DR-135 Mark III with a Microtelecom WX3IN1+. I use AB4BJ-2 (mobile), AB4BJ-10 (shack) and AB4BJ-15 (weather).